Vista Snipping Tool is for capturing a portion of the screen in order to save it as an image in various file formats. In other words, Vista Snipping Tool is a screen capture tool that is available with Windows Vista. You can find the Vista Snipping Tool application within the Accessories of the Microsoft Windows Vista OS. It is possible to open the Vista Snipping Tool software application by a click to the Start button on the Start Menu and type "Snipping Tool" in the search box where "Start Search" is written by default. You will see as you type the name snipping that in the results pane under Programs items a short-cut to Vista Snipping Tool appears. If this is the first time you are using the Windows Vista Snipping Tool, a confirmation dialog screen is displayed asking you whether you want the Vista Snipping Tool placed on the QuickLaunch bar. If you click Yes, you will see that an application icon for Snipping Tool for Vista users is created on the LaunchBar as a short-cut to the Snipping Tool. Window Snip is generally what I use so I selected this for my case. Then where ever you move the mouse over, a red border arround available windows of applications will be displayed and when you click on the screen this means that you have selected the window you want to capture. This captured image will be displayed in the Vista Snipping Tool. 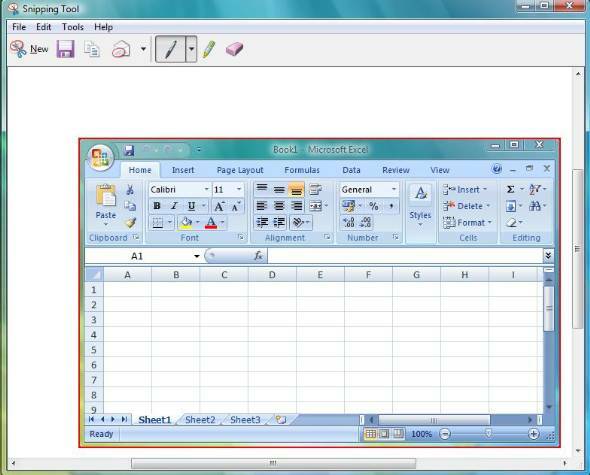 The Windows Snipping tool for Vista also provides additional options for editing the content. You have a pen, a highlighter and an eraser to edit the captured image manually. You can send the image via e-mail as an attachment also by using the Send Snip button on the top menu. By using Snipping Tool Vista users can save the captured image in various formats including .png (Portable Network Graphics file), .gif, .jpg, and html file formats.